To expand into a completely new category; "landscape contractor" to "pool builder" as an example. To target a new consumer segment you are not currently servicing. An example would be a "mass production" pool builder moving up market to become a "luxury" pool builder. Let's dig deeper into three specific types of brand extension. 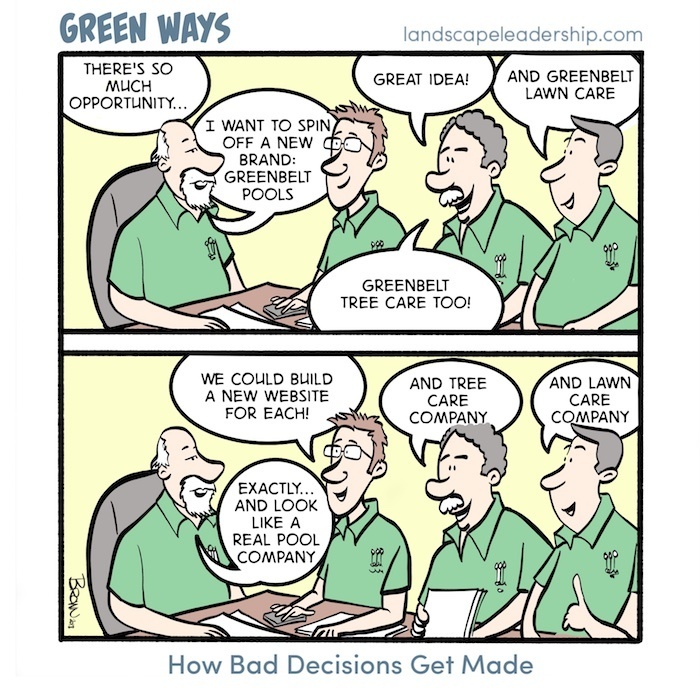 A horizontal brand extension is the strategy the boys at Greenbelt Outdoor are contemplating in our Greenways comic. The aim is to extend the Greenbelt brand from "landscaping" to "pool construction", "lawn care", and "tree care". "We've been building a lot of pools lately. Maybe we should create another brand so we look like a real pool company and get even more opportunities." KEY: To pull off a horizontal brand extension like this you must keep price and quality consistent across brands and categories. This is easier said than done. More on this in a minute. Vertical brand extension consists of increasing or decreasing the quality and price of your existing services to satisfy a refined segment in the market. A "mass production" pool builder moving up market to become a "luxury" pool builder. A high-end custom deck builder moving down market to become a mass production deck builder. In each case, the pool builder and deck builder are looking to penetrate the opposite end of their market. "We're already maintaining and caring for these large estates and gardens, why not offer the same services to the lower end of the market where there is so much opportunity?" This is mostly the mindset of production-minded companies. I say this because, from an operations point of view, it should be fairly simple to move either up or down market. After all, you already have the people, equipment, and expertise. What is not anticipated are the many risks involved with extending your brand up market or down market. KEY: Pricing and quality of services must also move up or down to match market expectations. The mistake most lawn and landscape companies make is creating another brand so they can appear to be something they are not. Essentially, the change is in name alone. 1. Extending your brand can negatively impact your current positioning. You've worked hard to create an identity and differentiate yourself from your competitors. Now, through brand extension, you're putting your identity (i.e.- your positioning) at risk. Your customers hire you because of how they perceive you to be different. Now you're confusing them. This is a strategy that not only cannibalizes your brand, but marginalizes your reputation.1 You will ultimately alienate many of your current customers, negatively affecting customer loyalty. This is especially true when moving down market. 2. A brand extension can create or amplify a culture clash. If you are a "creative" company like a landscape design/build firm and you spin off a "productized" service like lawn care into a separate company, you will be burdened with a clash of cultures. Operations will undoubtedly become much more complicated which can negatively impact the quality of your work. 3. A brand extension is expensive. To pull this off the right way you will be creating an entirely separate brand with its own dedicated staff, marketing budget, etc. This is expensive. It's not as simple as just coming up with a clever name and logo. This is where many companies go off the rails a bit. They think all that needs to be done to launch a new brand is to build a new website for it. Launching a new website is not the same thing as launching a new brand. It's just one small step. Without a separate marketing budget company resources are spread thin across brands and results are diluted. Thus, it can be very difficult to get your desired return on initial investment. You are extending your brand horizontally into a new category in which you will maintain the same price and quality standards. Kingstowne Lawn & Landscape and Kingstowne Pest Defense is an example. Do not use your same brand name if you are moving up or down market. Completely separate the new brand from the original. Otherwise, you'll create confusion and marginalize your reputation (i.e.- screw yourself). Are you considering a re-brand or brand extension for your company? Yeah, we can help you with that; from developing a Brand Positioning Strategy to naming your company and creating your logo and brand guidelines. Schedule a meeting with us to learn more. Want more insight like this? Join 4,000 other green industry professionals who are subscribed to our blog. Just add your email in the form below, or go here.